Claude-Joseph Vernet – The Ashmolean Museum A1036. 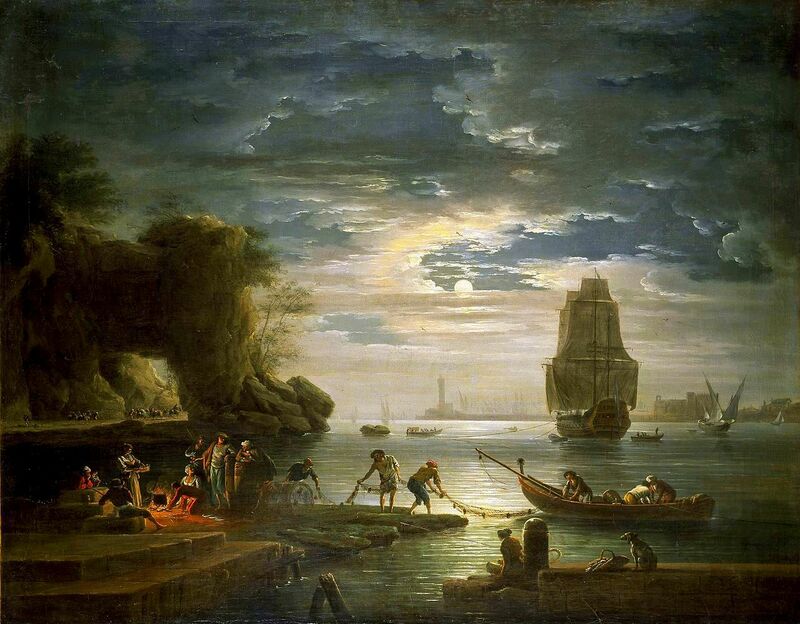 Title: Coastal Scene (La nuit). Date: c.1750s. Materials: oil on canvas. Dimensions: 97 x 123 cm. Acquisition date: 1967. Nr. : A1036. 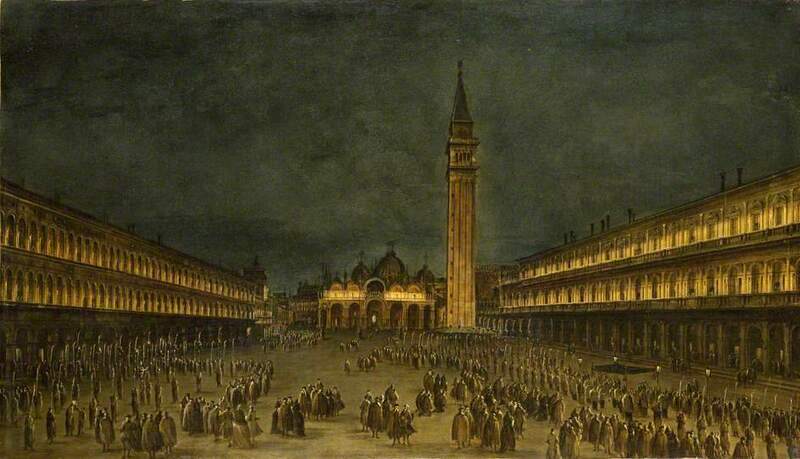 Source: https://commons.wikimedia.org/wiki/File:Claude_Joseph_Vernet_-_La_nuit_(Ashmolean_Museum).jpg /. I have changed the light, contrast and colors of the original photo. Salomon van Ruysdael – The Ashmolean Museum A1065. 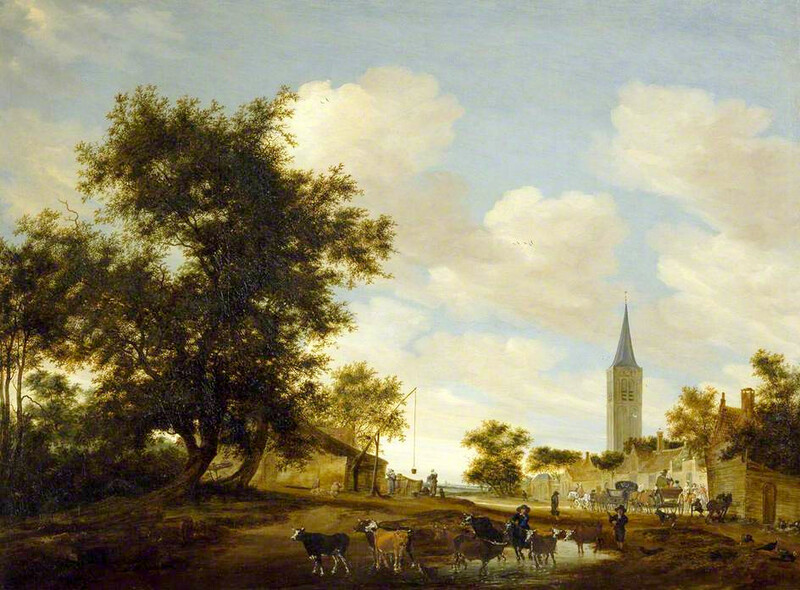 Title: A Draw-Well with Cattle before Beverwijck Church. Date: 1657. Materials: oil on canvas. Dimensions: 112 x 150 cm. Inscriptions: SVR (in monogram) 1657. Nr. : A1065. Source: http://ichef.bbci.co.uk/arts/yourpaintings/images/paintings/ashm/large/ash_ashm_wa1972_8_large.jpg. I have changed the light and contrast of the original photo. Francesco Guardi – The Ashmolean Museum. Title: Venice: the Fondamenta Nuove with the Lagoon and the Island of San Michele. Date: late 1750s. Materials: oil on canvas. Dimensions: 72 x 120 cm. Source: http://p5.storage.canalblog.com/58/62/119589/103847638_o.jpg. I have changed the light of the original photo. Jan Both – Ashmolean Museum A704 (WA1943.1). 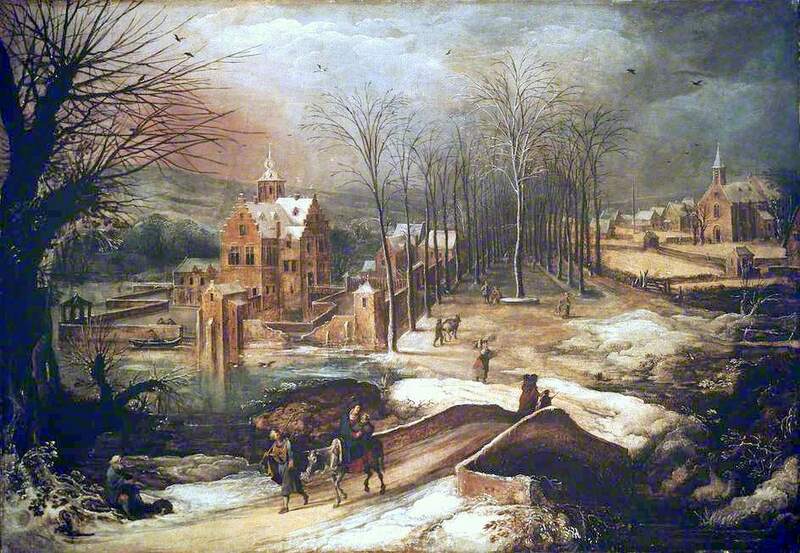 Italianate Landscape with Muleteers (1640s-1650s). Materials: oil on canvas. Dimensions: 127.5 x 160.5 cm. Aquisition: Presented by Francis Falconer Madan, 1943. Nr. : A704 (WA1943.1). P.S. I have changed the light, contrast and colors of the original photo. Materials: oil on canvas. Dimensions: 64 x 81 cm. Acquisition date: 1855. Nr. : A149. Source: ichef.bbci.co.uk/arts/yourpaintings/images/paintings/ashm…. P.S. I have changed the light, contrast and colors of the original photo. 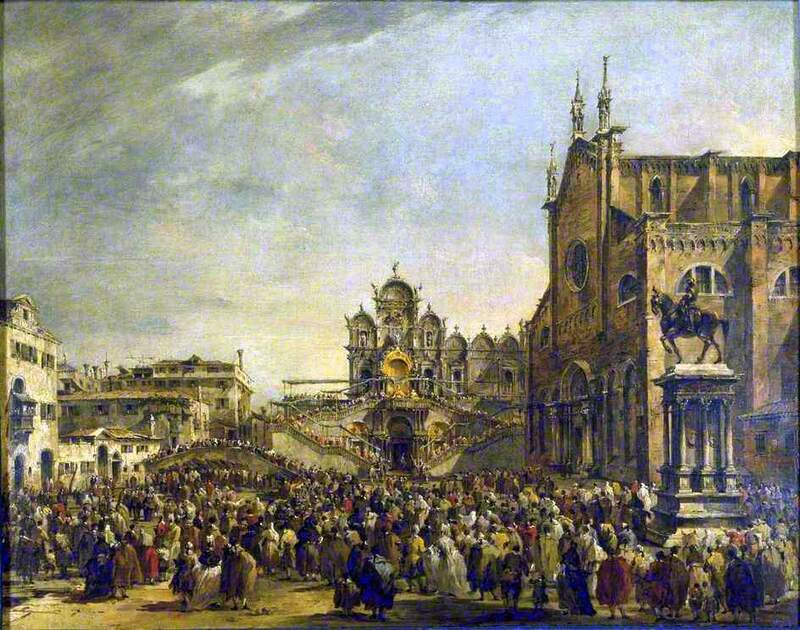 Guardi painted four scenes to celebrate the historic visit of Pius VI to Venice from 15-19 May 1782: The Pope met by the Doge(Philadelphia Museum of Art); The Te Deum at SS Giovanni e Paolo(private collection, Paris); the Audience of the Senate(Sotheby’s, Florence, 24 September 1985, lot 19; and the Papal Blessing(A149). Commissioned by the Venetian state through the agency of Pietro Edwards on 21 May 1782, they were completed by 24 December 1782. A number of preparatory drawings for A149 are known, while Guardi and his studio made other versions, of which the most important is that at Upton House (National Trust). An elaborate temporary staircase and balcony was erected in front of the Scuola Grande di San Marco to accommodate the Pope, the Doge, the Patriarch of Venice and other dignitaries. 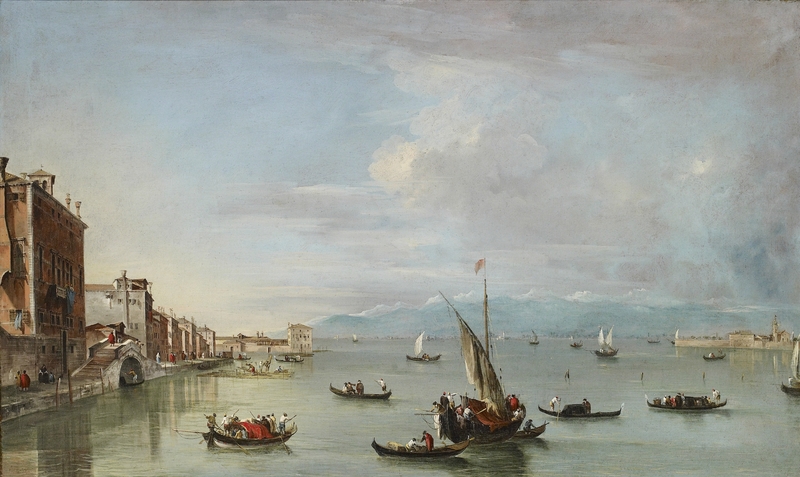 Guardi elongated the proportions of the buildings and of the Colleoni statue to give greater verve and dramatic effect to the scene (http://www.ashmolean.org/ash/objects/makedetail.php?pmu=730&mu=732&gty=asea&sec=&dtn=15&sfn=Artist%20Sort,Title&cpa=1&rpos=7&cnum=&mat=&pro=&anum=&art=guardi&ttl=&sou=). Materials: oil on canvas. Dimensions: 48 x 84.5 cm. Nr. : A386. Source: ichef.bbci.co.uk/arts/yourpaintings/images/paintings/ashm…. P.S. I have changed the light of the original photo. The ruined church of Muiderberg (seen on the hill in the distance) is situated near Naarden, south-east of Amsterdam on the Zuider Zee, where Ruisdael’s father was born. Probably painted in the early 1650s, when the artist was still living in Haarlam, it is based on drawings made in the locality. There is a compositional study for the painting in the Albertina, Vienna, which corresponds closely but does not include the carriage and riders on the right. It may be that this group has been added by another hand but at an early date as it appears almost unaltered in a landscape in the Szépmüvészeti Muzeum, Budapest, attributed to Ruisdael’s contemporary, Jan van Kessel. Information derived from the Ashmolean Museum’s Complete Illustrated Catalogue of Paintings. Prov: Willem II; Nieuwenhuys; Sir Thomas Baring and by descent to the 2nd Earl of Northbrook. Bequeathed by Francis Falconer Madan, 1962; WA1962.17.24.White 1999, p. 137. One of a group of paintings of waterfalls in mountainous scenery with fir trees painted by Ruisdael in the early 1660s. 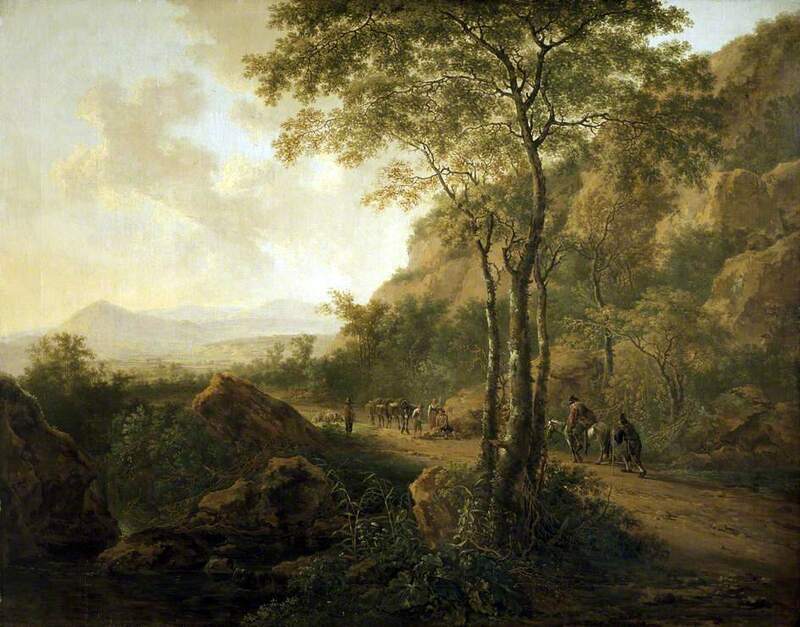 The details are based on the artist’s recollections of the countryside along the Dutch-German border which he visited in about 1650 (http://www.ashmolean.org/php/makepage.php?db=wapaintings&view=llisti&all=&arti=ruisdael&titl=&mat=&prov=&sour=&acno=&park=&strt=1&what=Search&cpos=2&s1=artist&s2=mainid&s3=&dno=25).